Price: $49.00 - FREE TO MEMBERS! Drones, also known as Unmanned Aerial Vehicles (UAVs) typically in the form of multi-rotor sub-55lb vehicles, are making their way onto construction sites in the U.S., despite the uncertain status of Federal Aviation Administration (FAA) regulations, and internationally. Their uses include survey and measurement (laser scanning [LIDAR], thermal imaging/infrared [FLIR] and other data-capture technology), project controls (documenting daily/weekly progress via aerial photography), QA/QC and maintenance inspection (visual inspection of bridges, curtain walls, bottom of excavations and hard-to-access and/or otherwise unsafe locations), safety inspections, production planning, logistics (handling and delivery of tools, parts and materials, particularly on horizontal construction), emergency response assistance and security. 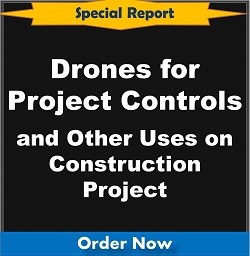 This paper is based on material collected from the author’s ongoing study of drone use on construction projects, as well as from research projects currently underway by universities and private organizations. Also included are considerations for contract specifications for drone use on construction projects.The paper was first presented at the 2015 AACE International Annual Meeting in Las Vegas.